The ESU likes to organize joint events with other Associations and Foundations. 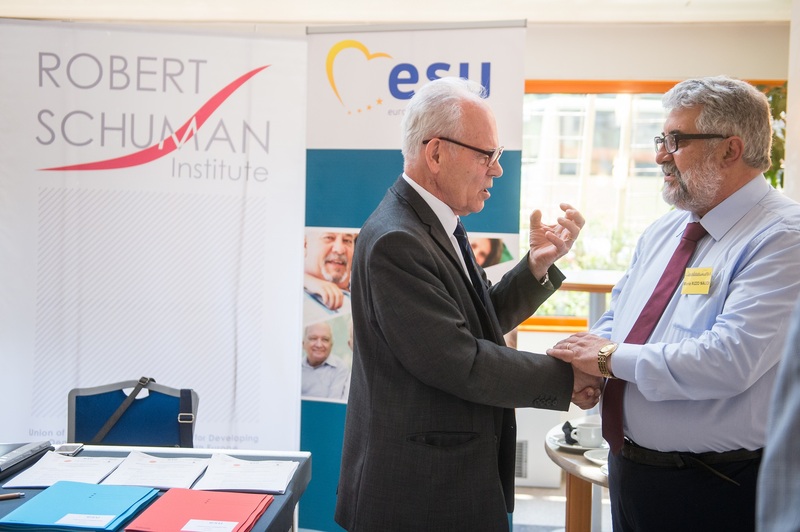 For a two-days Conference in Budapest (26-27 May) on active ageing and the participation of seniors in public life, we could count on the Robert Schuman Institute, Fidesz and the Konrad Adenauer Stiftung. During the first day of the ESU-RSI-Conference, the Hungarian National Seniors’ Council presented the work of several working groups. It was an impressive program in the beautiful Hungarian Parliament, where the issues related to active ageing, seniors’ representation in media and concepts for multi-generational leisure time activities were presented for almost 200 participants. In her opening speech ESU President Prof. An Hermans stated that seniors are not a burden but an asset to society. She added that only if citizens have the feeling that the EU cares for them and that they can be involved in European policy making, there will be a future for Europe. The results of the work of the ‘Seniors’ media working group’ was presented by Sarolta Monspart, former president of the National Family Leisure Sport Association and former president of the Hungarian Olympic Committee. During her powerful speech Sarolta Monspart, invited the audience in the Hungarian parliament, to do some exercise…. Almost everyone followed her for some very joyful moments. The second day of the ESU conference in Budapest started its (early) morning with an ESU executive committee meeting. Afterwards, the conference on Active Ageing and participation of Seniors in society resumed with a presentation of Prof. Steven Van Hecke, followed by a forum of Hungarian speakers. Further, there were discussion panels with ESU member representatives on the participation of seniors in public and political life, including the arena of European politics, regional differences, approaches to activating seniors, the role of volunteers in civil societies, as well as a reflection on Christian values.